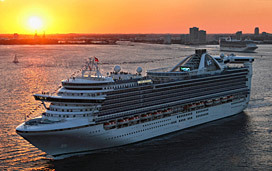 (4:30 p.m. EDT) -- An issue with the propulsion motor on Caribbean Princess will likely impact the remainder of the ship's current itinerary, according to a statement from Princess Cruises. As a result of reduced speeds caused by the problem, the ship arrived more than four hours late for its scheduled call on St. Maarten on Monday, and it will stay there until the situation is fully evaluated by the line's technical team. Princess has not yet released an updated schedule for the seven-night Southern Caribbean voyage, but a few folks on the Cruise Critic message boards have said the ship is still in port. "We are currently on the Caribbean princess, at this point we have been told to be on board by 6:00pm for departure at 7," says said BCFamily. "We have been told that they have significant damage to the port side propulsion engine and that they will have a revised itinerary later this afternoon." Additionally, several boards members booked on subsequent sailings and are wondering whether the necessary repairs will affect them. "We are boarding this coming Sunday," says decibel123. "Does that mean our cruise could be cancelled? We are flying out from Montreal and did our own air transportation. Would Princess reimburse our flight?" Issues like these beg questions of what, if anything, the line will offer in the way of compensation. Join the discussion here, and stay tuned for more information as it becomes available.